Head chef and marketing guy! 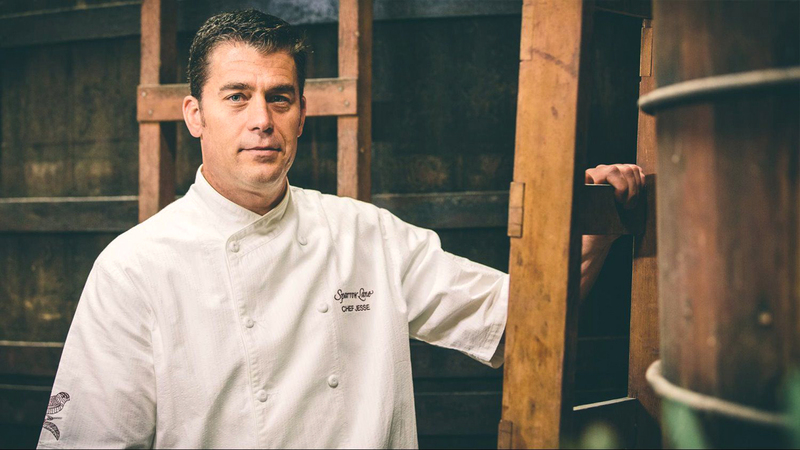 Chef Jesse works directly with distributors, brokers and consumers to develop new business around the country. In addition, he creates healthy recipes that use vinegar as an ingredient to enhance the true flavor of food. What makes Sparrow Lane Vinegar so different? Following in the footsteps of our founder, we use only the finest wines from the Napa and Sonoma regions, and the best fruits and herbs from throughout California. Our main emphasis is on the time tested Orleans method of making barrel aged vinegars, a process which takes 13 to 24 months. It allows us to get the best flavor and balance of fruit and acid to create the finest vinegars in the market place. “I grew up in the Central Valley around family farms and restaurants. I not only learned a love of food, but also a love and appreciation of the land. I have been in restaurants for over 23 years—most of the time as a chef or owner. It has been an amazing life.